ETSU faculty members and teaching assistants are encouraged to incorporate research and information literacy skills into their courses. 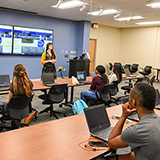 Instruction librarians will work with your students in your classroom on or off campus, in Sherrod Library, or online in your ETSU online or Tennessee eCampus course in D2L. Faculty may request different types of instruction tailored to class needs. Instruction librarians can develop handouts, research guides, and instructional videos tailored to your course assignments and provide research and reference services for your course in D2L. Because library instruction is often in high demand at peak periods of the academic year, please make your request at least two weeks in advance of the desired date. After you have scheduled a session, you will be contacted by a library faculty member who will develop a presentation in accordance with your students' research needs.